Imagine Rainier Beach with youth who are healthy, happy, full of vision and prepared for the future. 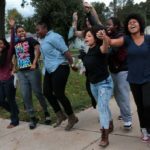 Can you imagine youth who access the educational opportunities and community resources that improve quality of life for themselves and their families? We strongly believe this can be realized through a community collaboration effort and your support is needed! 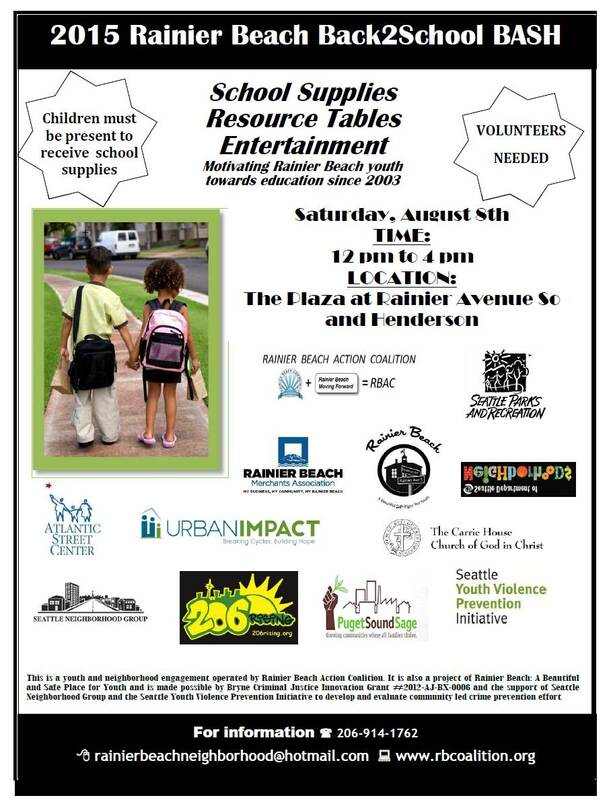 On Saturday, August 8, 2015, 1:00 pm – 4:00 pm the Rainier Beach Action Coalition (RBAC) formally Rainier Beach Community Empowerment Coalition (RBCEC) and Rainier Beach Moving Forward (RBMF) in partnership with residents and dozens of organizations from the neighborhood will sponsor the 13th Annual Rainier Beach Back 2 School Bash (B2SB). The purpose of this event is the same it has been since the first one in 2003 – to affirm the greatness within each child and connect them to community and education. 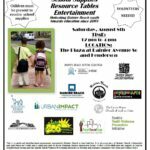 This event has a rich history of strengthening community support for education, providing services to families in need and getting people involved in neighborhood projects.. Our goal is to provide 600 students and families, on a sunny Saturday in August with backpacks, school supplies and information about community and educational resources. We invite you to reserve a resource table ($45) and join with residents, social service agencies, faith-based organizations, and local businesses to make the 2015 B2SB a success. We welcome cash donations, in-kind contributions, sponsorship and/or volunteers. We also invite you to donate back packs. For specific details, please refer to the enclosed Participation Form. Thank you for caring about our youth and remember August 8, 2015. PS The location of the event is “The Plaza” at Rainier and Henderson. 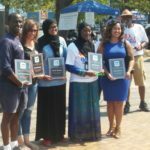 The 2015 B2SB is support in part by Rainier Beach: A Beautiful Safe Place for Youth which is made possible by Byrne Criminal Justice Innovations Grant # 2012-AJ-BX-0006 and the support of Seattle Neighborhood Group and the Seattle Youth Violence Prevention Initiative. Hi. I would like a table and am prepared to send you a check. To whom do I make it out? Tx. – Jen Cole, Feet First. My name is Joyce Yee, and I am an organizer with the League of Education Voters. I would like to have a resource table at your event on August 8th – do you have a vendor registration form of any kind, and a contact to whom I can send it in, along with the fee? We will send participation form under different cover.